Finally, Microsoft has unveiled its major update to the current Surface Book lineup. The new Surface Book 2 13.5” is more powerful than ever. It now comes with the latest quad-core Intel Coffee Lake processor and NVIDIA GeForce GTX 1050 graphics. With the right accessories, your Surface Book 2 13.5” can be even more powerful, productive, and entertainment. Here we have a great list of the best accessories that will work great with the Surface Book 2 13.5”. Precise cut and fit with 9H hardness HD glass with 2.5D rounded edges. Transform your Surface Book 2 into a full-fledged desktop PC. 1 x Gigabit Ethernet port. An audio jack, a power port. Compatible with Surface Pro 3, Surface Pro 4, Surface Book, Surface Book 2, new Surface Pro 2017, and Surface Laptop. 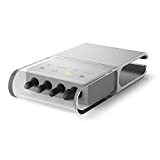 Microsoft Surface Dock is a solid solution for those who want to use their Surface PC as their primary workstation when they are at home or office. It can transform not only your Surface Book 2 but also Surface Pro and Surface Laptop into a full desktop PC. The Microsoft Surface Dock is my best docking station solution I have ever have. By plugging in the magnet Surface Connect cable and everything will instantly work. The dock comes with four high-speed USB 3.0 ports, a gigabit Ethernet port, an audio output, a power port and two Mini DisplayPorts which claims that it can support two 4K displays. The greatest pen for your new Surface Book 2. Compatible with Surface Studio, Laptop, Book, Book 2, Pro, Pro 4, Pro 3, and 3. Available in platinum, black, burgundy, and cobalt blue. The biggest update for Surface Pen has arrived. The new Surface Pen designed for the new Surface Pro and Surface Book 2 now offering 4,096 pressure sensitivity. Together, this new pen has the lowest latency ever only 27 ms makes the ink flows directly from the tip virtually no lag at all. Just like its predecessor it has 2 buttons, the Barrel button, and tail eraser. It connects to your Surface Book 2 with Bluetooth 4.0 to brings Windows 10 Ink features to life. Use your MicroSD card with your Surface Book 2. Compatible with Surface Book, Surface Book with Performance Base, and Surface Book 2. If you are looking to expand the storage of your Surface Book 2, the only thing you can do is using the SD card slot. Since it is a full-sized SD card slot, you will need a full-sized SD card or SD card adapter. However the depth of the slot is about half length of the card, so it’s not a good idea to use the full-sized SD card as a permanent way to expand the storage. 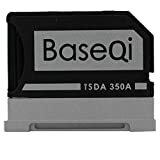 Fortunately, there is a MicroSD Adapter made by BASEQI that is firm and nicely fit the Microsoft Surface Book 2 card slot without sticking out. With that said, you can now use any microSD card to expand storage on your Surface Book 2. It has the same color and aluminum designed just as your Surface Book 2. Add extra space to your Surface Book. Available from 32GB to 256GB. Class 10 / UHS 3, 100MB/s read and 90MB/s write speed. 4-proof protection from water, extreme temperatures, and other harsh conditions. By inserting an extra MicroSD, you can expand more storage of your Surface Book 2 or you can it for data backup. Surface works with standard microSD card formats including microSD, microSDHC, and microSDXC. The next one is from Samsung, The EVO UHS-3 card also rated as a class 10 and UHS-3 transfer speed. It can transfer up to 100MB/s and 90MB/s read and write speeds respectively. It is also able to record the 4K UHD video recording and handle most apps and games without any problems. It does come with MicroSD card adapter so you can use it in any computers with full-size SD card slot. Designed for Surface Book with precise cut and fit. 9H hardness HD glass with 2.5D rounded edges. Easy to install, bubble free. Available in 2 versions, Anti-Blue Light and HD Clear. The 13.5 inches on the Surface Book is so much beautiful. To maintain this beautiful screen for a long last, you will need a strong screen protector. 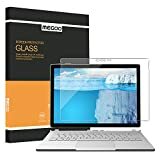 This Megoo Tempered Glass Screen Protector is specially designed for Microsoft Surface Book. It will protect your device’s screen from scratches, bubble free, significantly reduces smudges and fingerprint. It also features a precise cut for every single whole including Windows hello sensor and camera, front camera, light sensor and so on. The screen protector made from a 9H hardness tempered glass providing the best protection from drops and scratches. It also available in two versions, the Anti-Blue Light and HD Clear. Easy to type, apply and remove. 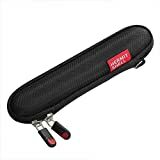 Can protect from dust, spills, key wear and more. Not fit with Surface Book with Performance Base. Talking about protection, your Surface Book’s keyboard is likely needed your attention as well. Even, it made of a high-quality material, it still getting scratches and dirt over time. You can protect your Surface Book’s keyboard with the keyboard skin cover. 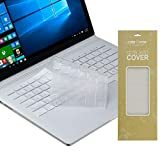 This Case Star skin cover is made specifically for the original Surface Book version (not fit Surface Book with performance base). Every key is perfectly molded to match each key shape and size. Moreover, It is flexible, clear and ultra thin makes it easy for typing. On top of that, it also easier to apply and remove for cleaning or washing. Project your Screen wirelessly to a TV. Can be projected from smartphones, tablets, and laptop. Using only USB and HDMI port. This Microsoft Wireless Display Adapter allows you to share what’s on your device on an HDTV, monitor, or projector wirelessly. This adapter uses the Wi-Fi CERTIFIED™ Miracast® technology, so every device that supports the technology including your smartphones, tablets, and other laptops can connect to this device as well. This adapter is really portable and easy to connect. To install this adapter, you just plug the adapter’s USB and HDMI into appropriate ports on your HDTV. In addition, this adapter can deliver a reliable connection with up to a 23-foot or 7 meters range. Bring entertainment to a next level. No cable or dongle required for Windows 10 with Anniversary Update or later. Can be connected via micro USB cable, Xbox wireless adapter, or Bluetooth. Support custom button mapping on Windows 10. Do you want to play games on your Surface Book 2? The Surface Book 2 has more than enough power to play major games including Minecraft, DOTA 2, Counter-Strike, GTA 5 and so on. If you have a Surface Book 2 with Discrete Graphics you can even play graphics intense games like Tomb Riders, God of Wars and many others. 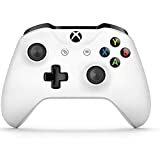 The Xbox One Controller is the best controller for Microsoft products including Xbox One, Surface, and Phones. The controller has been optimized to work best on Windows 10. The Wireless Adapter allows you to connect Xbox One controller wirelessly with any Windows 10 PCs, laptops, and Xbox One. Flexible in writing and drawing. 4 friction options: 2H, H, HB, and B. 2H – a very low friction. The new Surface Pen for Surface Book has major improvements including more pressure sensitivity (4096) and replaceable pen tip. 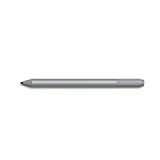 The default pen tip that came along with the new Surface Pen is an HB pen tip. This Surface Pen Tip kit has 4 pen tips allow you to better customize your drawing or your writing. Those available pen tips 2H, H, HB, and B differ by the pencil softness. 1 x 10/100/1000 RJ45 gigabit ethernet port. No optional external power supply. The Surface Book 2 is a powerful laptop which is greatly used for enterprise or corporate users. However, one thing is missing for those users is an ethernet port. They might also need some extra USB ports on the go for connecting to their workspace devices. Here is what they need to overcome this problem, a portable USB hub with an Ethernet port. This 2-in-1 Inateck USB Hub features 3 high-speed USB 3.0 ports and one 10/100/1000 gigabit ethernet port. 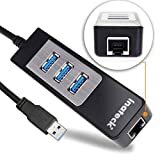 If you are a corporate staff or a network engineer, this USB hub will be a great choice for you because it allows you to connect to your corporate network via the LAN port. It also comes with a high quality 1 feet USB 3.0 cable. Compatible with Surface Book, Surface Pro, and Surface Laptop. Included 1A USB charging port. Included 4.8 ft Surface charging cable. Are you using your Surface Book as your main travel machine? This KINGDO Surface Car Charger can level up your Surface Book battery while you are on the road. 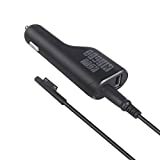 This car charger output the power of 12v/2.58A or 36W powerful enough to level up your Surface Book in fairly good charging rate. It also included a removable surface charging cable and an extra USB port with 5V/1A for charging your phones or tables. 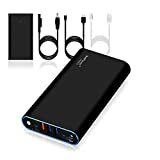 BatPower has finally released its new version of its ProE portable power bank series after the original version ran out stock for a while ago. The BatPower ProE 2 is now even better with the new design for better portability. On top of that, the new version also upgrades its power adapter’s power up to 90W instead of 65W on the older one. Support DisplayPort Alternate Mode can be used on both USB-C/Thunderbolt 3 systems. Support resolutions up to 3840×[email protected] (4Kp60). Recommended for Windows Mixed Reality. Microsoft has finally adopted the USB-C technology by replacing the Mini DisplayPort with a USB-C 3.1 port. Even it doesn’t support Thunderbolt 3, it still provides a better way for connecting and charging. In order to connect your Surface Book 2 to external displays, you will need a USB-C to HDMI adapter. Here we have the Plugable USB-C to HDMI 2.0 adapter which is verified to work seamlessly with your Surface Book 2 for connecting to external displays and Windows Mixed Reality headset. This adapter support HDMI 2.0 which drive resolutions up to 3840×2160([email protected]). Alternatively, if you are looking for Mini DisplayPort adapter for connecting from your Surface Dock to external displays, here we have the best list for you. Protect your Surface Pen while on the go. Fit Surface Pen and Pen Tip Kit. Included a hook for attaching to the bag. 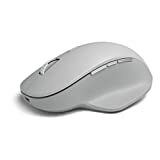 Related Topics Surface BookSurface Book 2Surface Book 2 13.5"
We appreciate hearing your thoughts, questions, and ideas about “The Best Microsoft Surface Book 2 13.5” Accessories in 2019”. Please post respectful comments and on topic. We will be replying back to you as soon as possible. 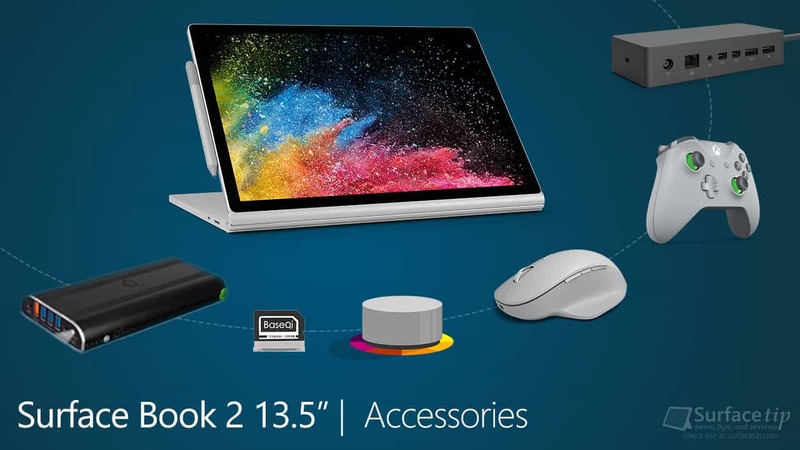 Share your idea about "The Best Microsoft Surface Book 2 13.5” Accessories in 2019".